Many of our users have asked us to put out a native app for SportTracks. While we're still some distance from making that a reality, we want to make sure our users can use their smartphones to upload their data. Fortunately, we already have a published interface for developers to connect into. The Open Fitness API has had some attention in the past, which is fantastic when developers incorporate it into their process. We put some serious structural design into it, and use it ourselves. If you are interested in incorporating SportTracks into your device or web page, just head over to Developers to get more information on our API. 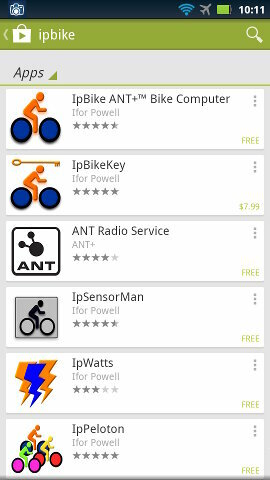 Some of our riders who are android users may be familiar with Ifor Powell's IpBike collection of apps. He has developed a full suite of apps for cyclists, including some pretty interesting group ride functionality that I'd like to know more about. However, I'd have to find some friends first. I was playing around with the app and noticed that he had already integrated support for the Open Fitness API, which is fantastic. I could add in the sporttracks.mobi configuration parameters, and it (mostly) worked. After fixing some minor issues and adding a great feature to recognize and sync bikes between IpBike and SportTracks.mobi, he added official support with his 1.3.9 release, making him the first app to intergrate directly. I am ashamed to say that I cannot fully utilize his app. Being more runner than cyclist, I'm barely scratching the surface of it's capabilities. For a full list, take a look at the IpBike Page. What I can show you is the integration capabilities. Install was a simple as one would expect. I quickly entered my credentials under the SETTINGS > OTHER PHONE SETTINGS > UPLOAD SETTINGS > SPORTTRACKS.MOBI SETTINGS. 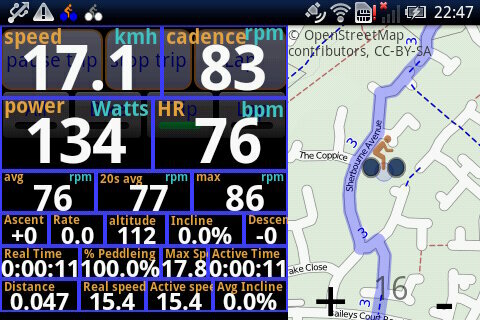 IpBike also currently supports AttackPoint, TrainingPeaks, Strava, RunKeeper and configurable Open Fitness API sites. While in there, I clicked the Upload Don't Ask checkbox because, well, I want all my workouts to be up on .mobi. Naturally. Second item on my checklist was to setup my bike. As this was a test run, I creatively named it "Testing bike". 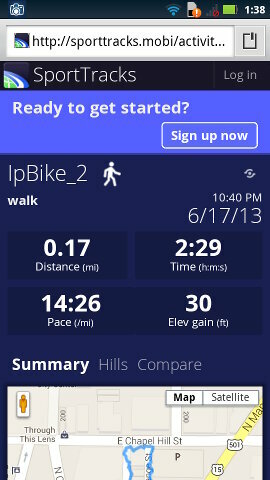 I set the default activity to "Walking" as that was what I was going to be doing. From this point, I gather my confidence, tied my flipflops extra tight, and took off at a PR-paced stroll. Hit Start GPS, select my "Testing Bike", and then "Start Trip". All quite intuitive. I've actually been using IpBike for a bit now, and have become quite used to the overlay format. The control buttons are behind a semi-transparent overlay giving pertinent information like speed, time, max and avg values of various metrics. Below the metrics display is a map, which is quite handy as well. After a grueling 0.28km stroll, I have my data and my complete activity. If I had the "Upload Don't Ask" feature enabled, it would automatically upload to sporttracks.mobi. But, for testing sake, I turned it off, which meant a quick navigation through RIDE HISTORY > ALL RIDES > [ACTIVITY] > UPLOAD. Press 'OK' and it starts uploading. It conventiently opens in the new activity in a browser window, giving you the full workout in detail. At this point, the workout will be public, so you have the opportunity to change the privacy to private or viewable by frineds only. One of the cooler features to notice is that is recognized my gear named "Testing bike" and added it as a part of the workout. Ifor told me that this uses a fuzzy match, but I don't know how far it will go to make a match. Trial and error will show the way. We quite excited to be able to have direct native app integration for SportTracks.mobi, and are doubly happy it's with Ifor. His apps are highly configurable and data-driven, which are characteristics that we look to build into our own products as well. You may be thinking, "Hmmm.... why didn't Todd including more screenshots?" The answer is that I took them, but that the data was actually pretty sparse, since I didn't have any sensors hooked up, and my walk was embarassingly short. Take a look at the IpBike page for useful screenshots. There are cool screen caps like these.